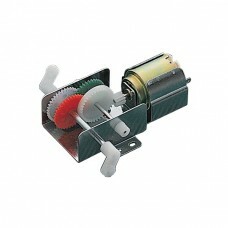 This 2 in 1 Gearbox Motor Kit can be used to create a fast or slow gearbox motor. This kit comes with a 3V DC motor and a selection of gears and axles for a variety of configurations. Choose a 1:60 gear ratio for a high speed 200 RPM motor, or a 1:288 gear ratio for a high torque 42 RPM motor. This kit also comes with some interesting connectors and a metal housing with mounting holes. The kit requires basic assembly skills. You will probably want to solder wires onto the motor terminals.